Difficulty: Grade F, YDS class 1. 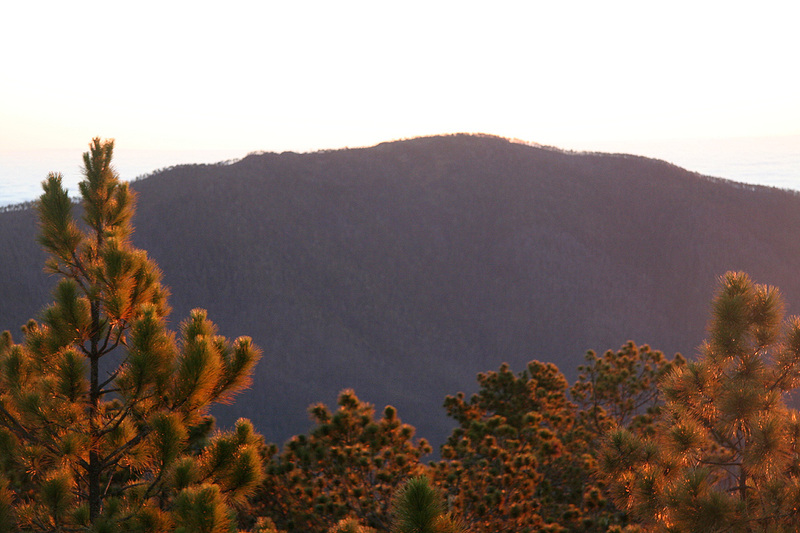 How to get there: The nearest town of some significance is Jarabacoa. From the south, travel north on Hwy. 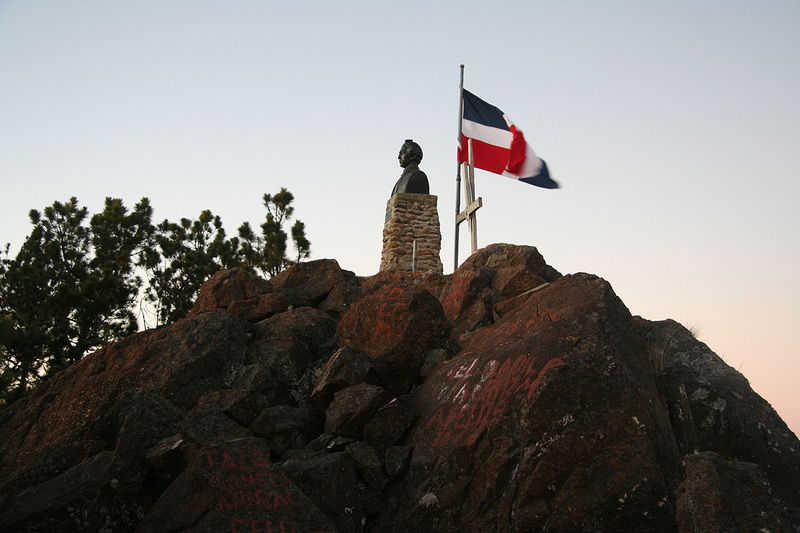 1 from the capital Santo Domingo and look for the exit going left (west) a few kilometer north of the town of Vega. Coming from the north, go south along Hwy. 1 from the large city of Santiago, again locate the clearly signed exit for Jarabacoa a few kilometer before the town of Vega. 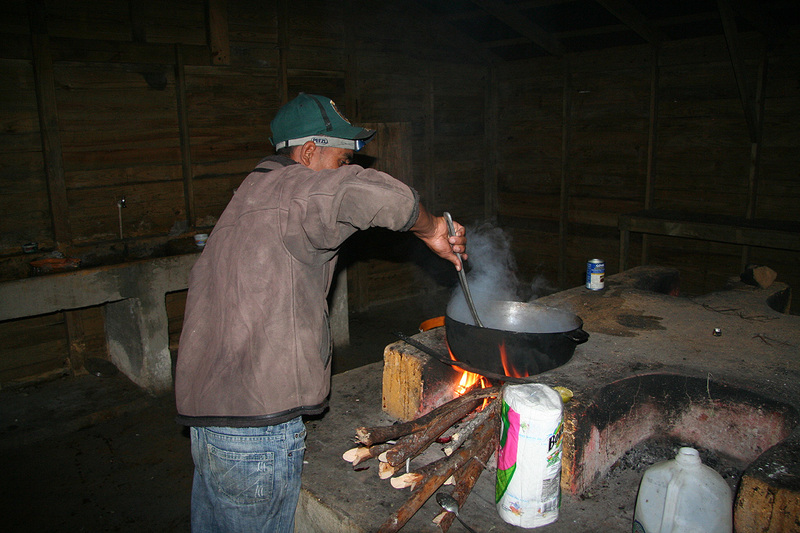 The town of Jarabacoa is located about 21 kilometer after you leave Hwy. 1. As you enter town, drive along Calle Indepencia, then make a right turn onto Calle El Carmen. As this street take you down a small hill, look for a sign saying Manabao. Turn left near the bottom of the small hill. Do NOT continue straight, if you cross a bridge, you missed the left turn (go back and locate the proper road). Measure from Calle El Carmen. 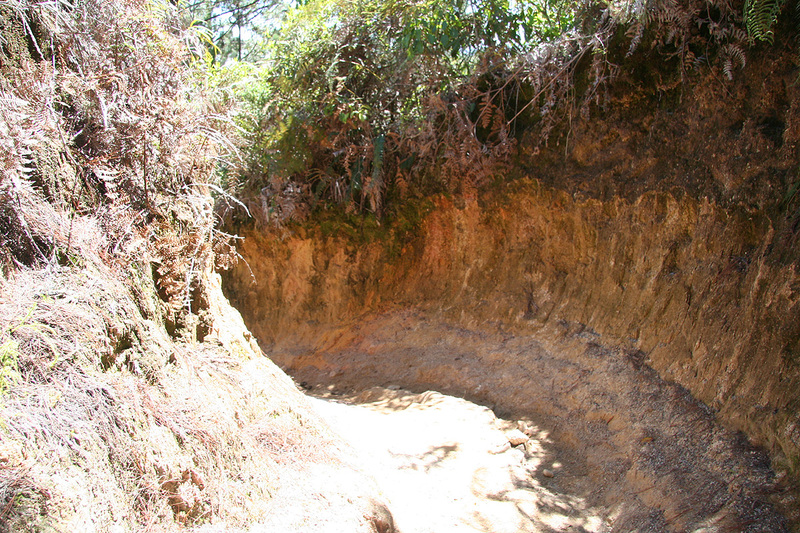 First, you drive through part of Jarabacoa, then curve right (follow the main road) at kilometer 2.5. 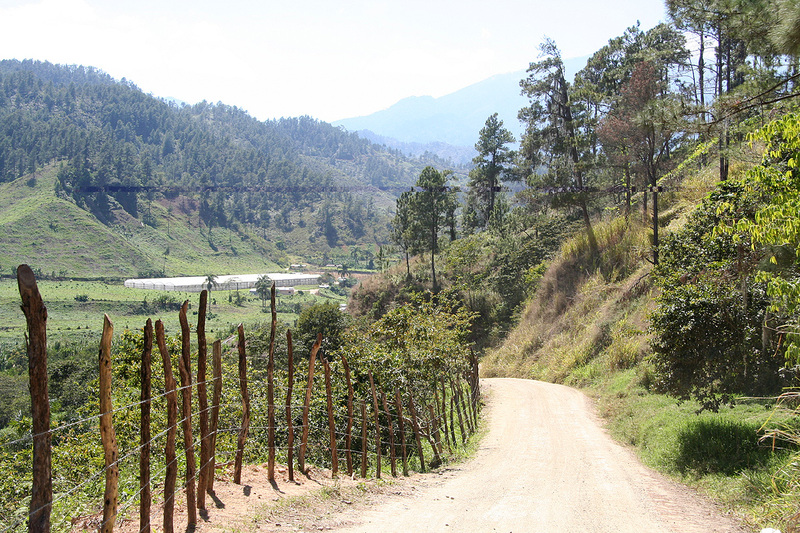 Contine along this road until kilometer 19.6 where you enter the small village of Manabao. Shortly after entering this village, make a right turn following the sign for La Ciénaga (kilometer 19.8). The paved road ends, but a quite nice dirt road continues. At kilometer 25.5, there is a short paved section as you enter the bridge across the main river. 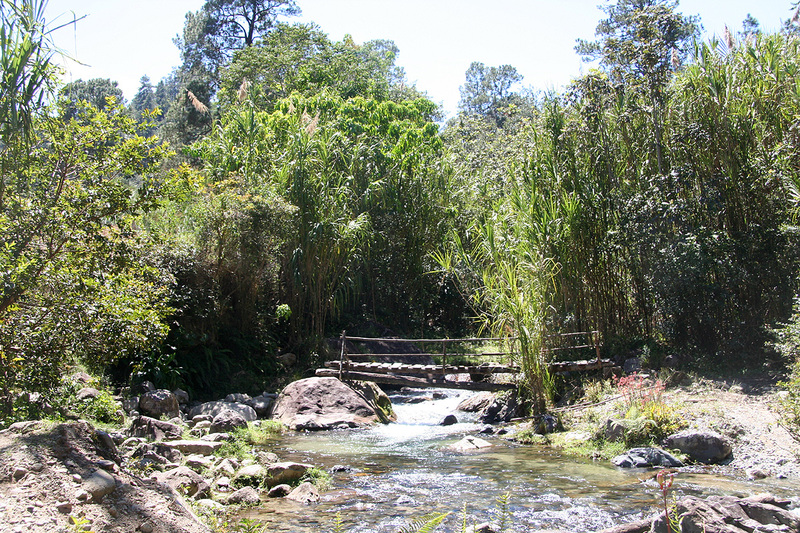 At kilometer 25.9, you cross a small creek, then at kilmeter 27.2 you turn left, following a sign for La Ciénaga. 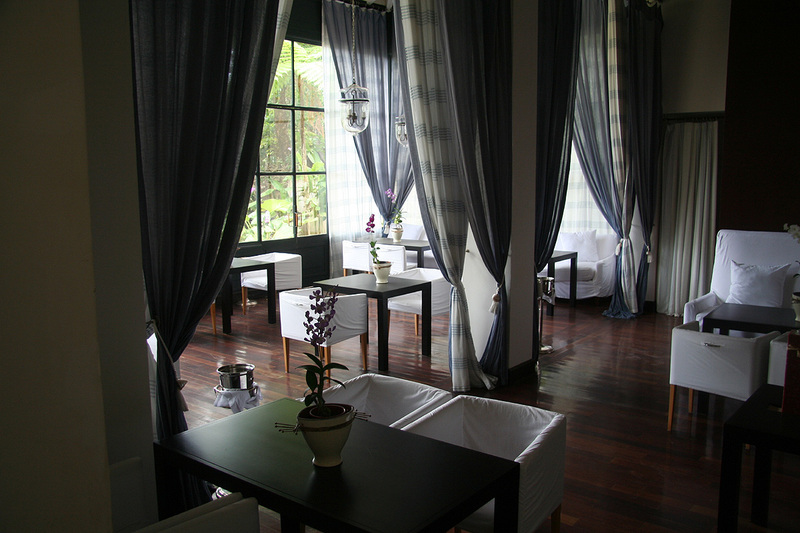 You will now arrive in the upper part of the valley with the tiny community of La Ciénaga. At kilometer 29.4, fork right up a rather steep hill with signs for the National Park Office. At kilometer 29.5 you arrive at the park office, there is a small parking on your left and more parking a bit further ahead. Park here, this is the trailhead. Location N19:04.035, W070:51.790, elevation about 1130 meter. The drive from Jarabacoa is quite scenic and you pass several small communities, drive carefully and this trip will take you about one hour. Route description: The trail starts by descending the concrete steps next to the Park Building and cross the stream on the wooden pedestrian bridge. From here, the trail continues across a small local hill, then into the bamboo grove. The trail is mostly flat, quite wide and VERY muddy for the first 4 kilometer to a small shelter near the river called Los Tablones. Shortly before Los Tablones you see the last, small farm across the river - quite an isolated, but very peaceful place to live. Near Los Tablones, the trail crosses the river (twice!) on small wooden bridges. A little further along, you will cross a rather small stream with crystal clear water. A sign tells you that this is "potable aqua", ie. safe water to drink. It may be well advised to drink and fill up your bottle here. 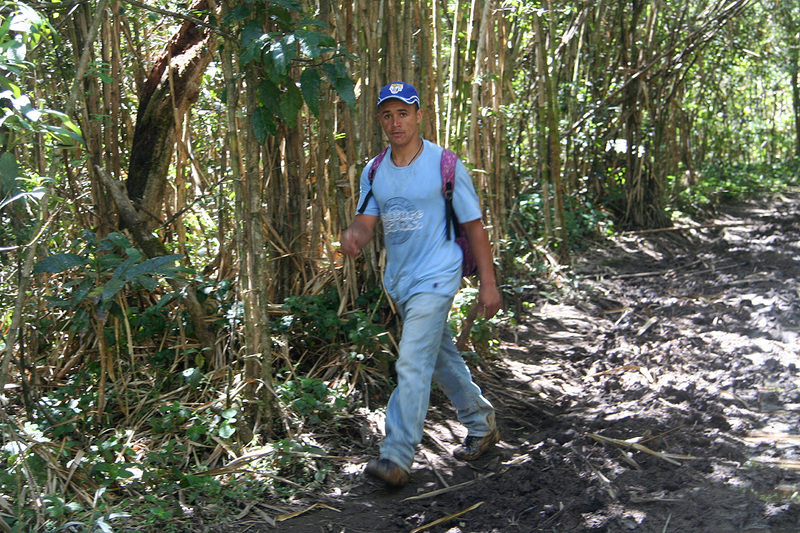 The trail now heads uphill, the route climbing a pretty distinct ridge, but still in jungle vegetation. The route continues at a pretty steady climb, fortunately, as you climb higher the trail, often deeply cut, becomes less muddy. The higher part of the route has more (small) rocks covering the trail. Finally, the route contours around a slope and crosses the divide. This point is at N19:01.956, W070:55.930, elevation 2722 meter, that is a vertical gain of 1600 meter (a full mile!) has been completed. It is a bit disappointing to see Pico Duarte for the first time - a seemingly very deep valley separates the peak from where you stand. Fortunately, the future is not quite as bad as it looks. The terrain is higher further right. The trail first continues along the top ridge, then descends, but only about 250 vertical meter to reach the refugio called Comparticion. The precise location is N19:02.244, W070:58.158, with an elevation of about 2480 meter. 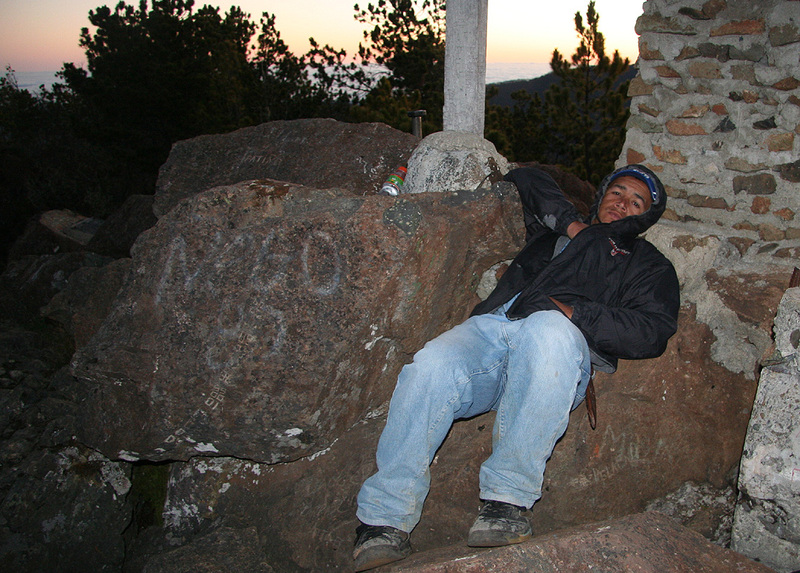 Most people will spend the night here and proceed to climb the peak the next day. 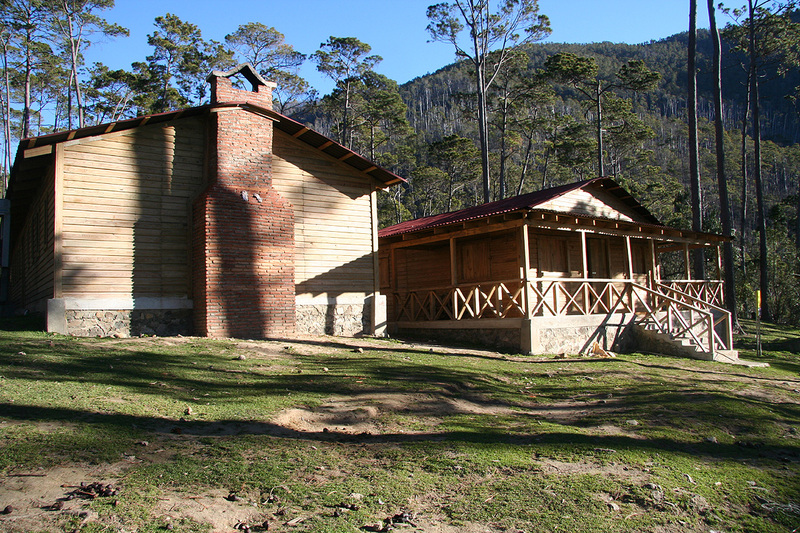 The refugio (mountain hut) consists of several buildings. 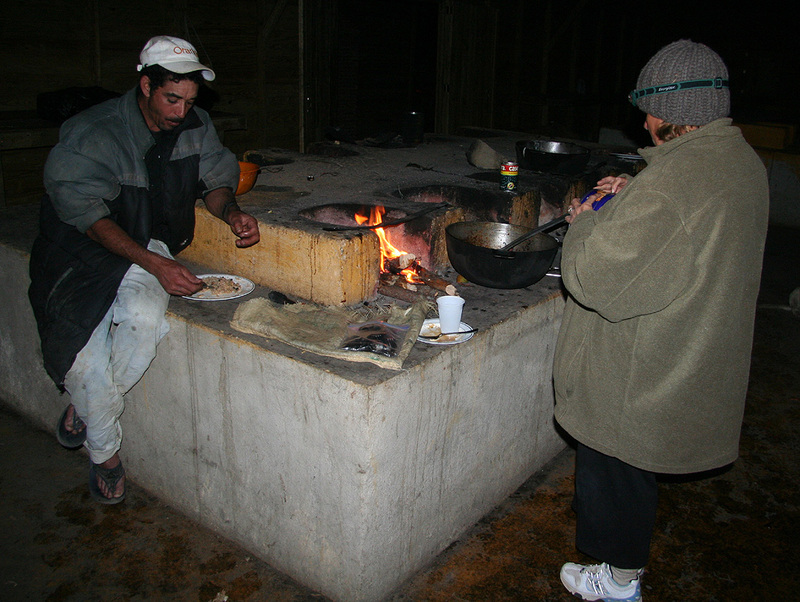 One building is reserved for cooking meals only, while another has a large, wooden floor to sleep on. The assumption is that people bring their own matress and sleeping bag. 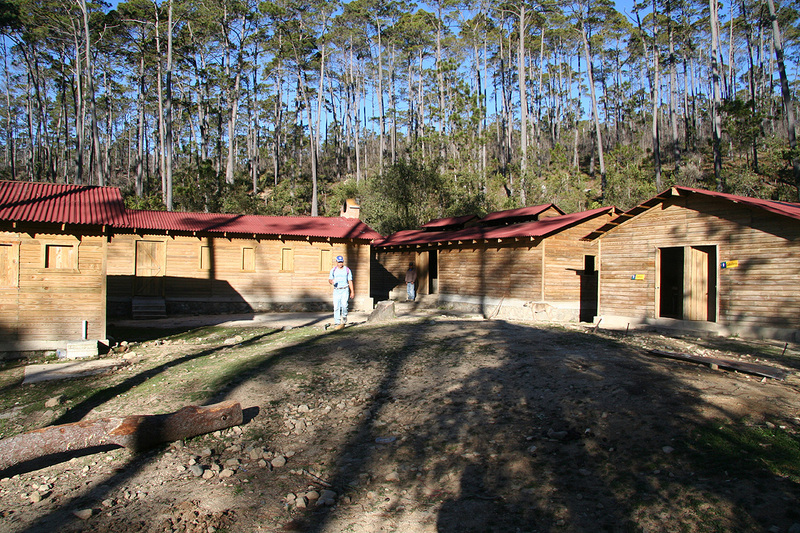 The distance from the trailhead to this shelter is about 18 kilometer along a tougher than average trail. 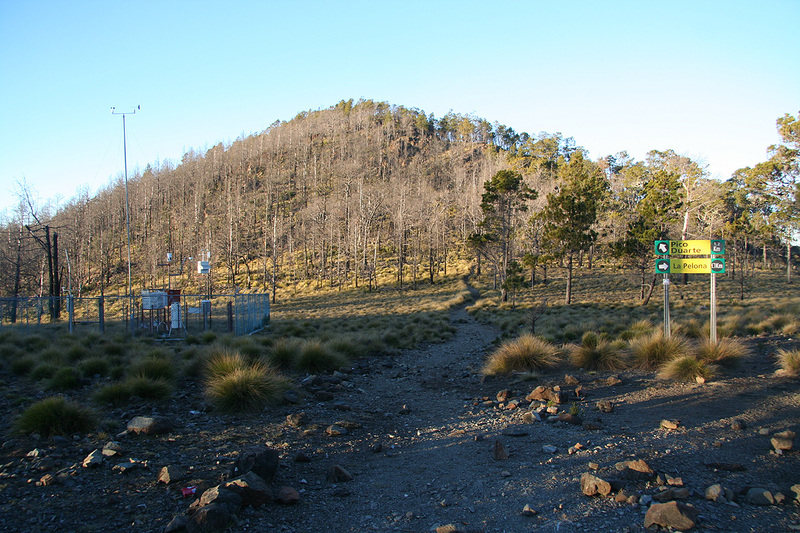 From Comparticion, the trail continues 5 kilometer to the summit. 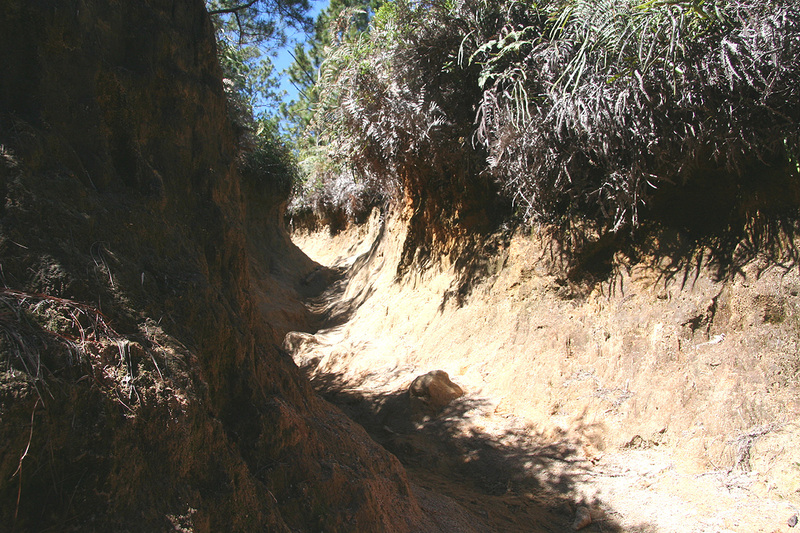 In the beginning, the route has a rolling pattern (some ups and downs) before arriving at the base of Pico Duarte proper. The trail then climbs this wooden hillside in several switch-backs until the slope eases into a flat section called Valle de Lillis after approximately 3.8 kilometer. The location is N19:01.774, W070:59.636, elevation about 2970 meter. There is a clearly signed trail fork here. 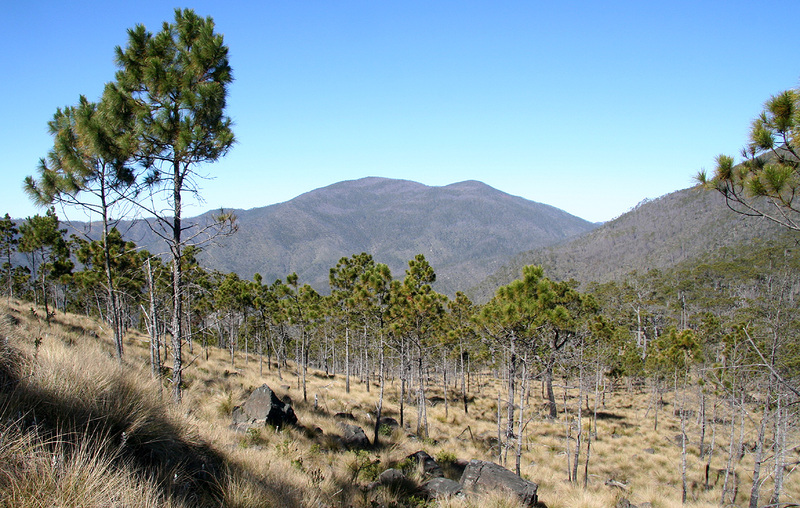 Straight ahead leads to Pico Duarte, while the right hand fork leads to the 4 meter lower peak called La Pelona. There is also a small, automatic weatherstation located near this trail fork. 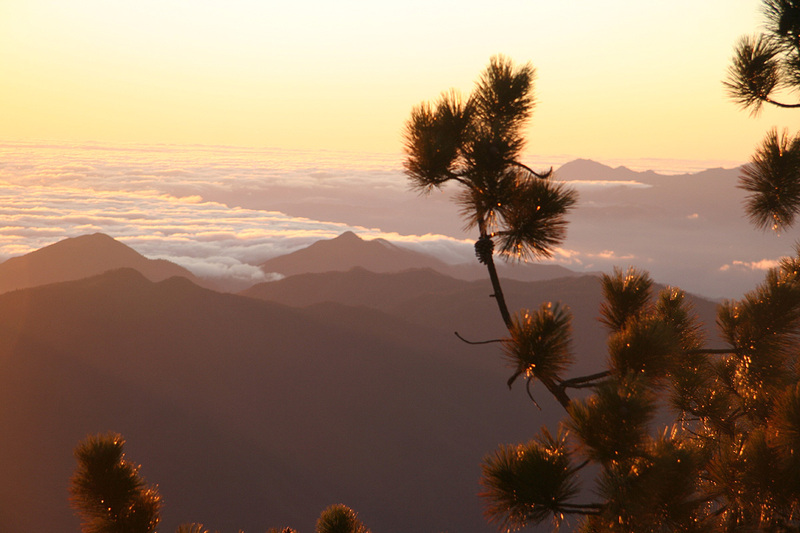 From Valle de Lillis, only a short and easy hike remains as the trail climbs the ridge of Pico Duarte and follows it to the pile of rocks and boulders that make up the highest point. 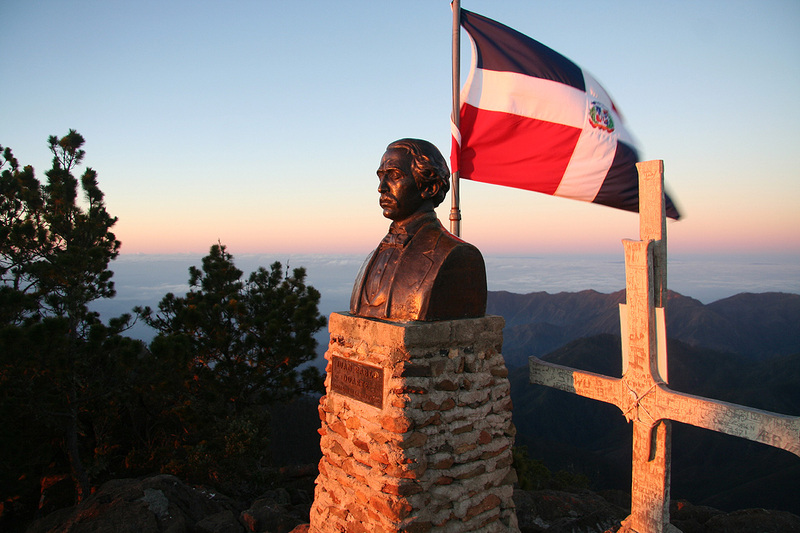 There is a bust of Juan Pablo Duarte (1813-1876) as well as a pole flying the flag of the Dominican Republic, plus a somewhat more worn wooden cross. Right next to the highest point there is a large official sign giving the (somewhat incorrect) elevation of 3087 meter. The entire trail is 23 kilometer and has a net climb of 2000 meter, while the actual climb about 2400 meter. My wife Heidi, told me pretty early that a trip to some southern, warm place would be perfect for her spring break. She had a double teaching load in January/February and a break in early March would indeed be good. After browsing around, I suggested the Dominican Republic, we had never been there, the climate should be good and the highest point in all of the Caribbean was conveniently located in this country! We left Bergen, Norway on March 8., our flight connected in Amsterdam, then directly to Puerto Plata on the north coast of the country. 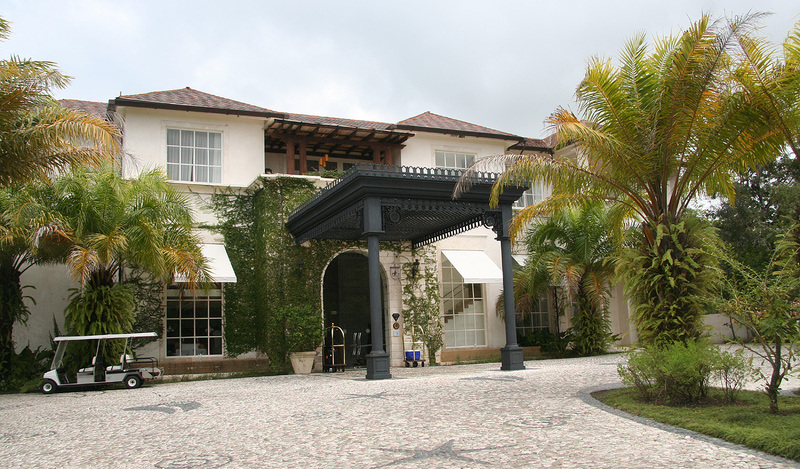 Our "Base Camp" was Casa Colonial, a small, but very nice hotel located on the beach just (south)east of town. The hotel helped organize a rental car, I asked for a 2-day rental from Sunday night to Tuesday night. Thus, I started out around 0600 on Monday morning, it was still pitch dark and the first thing I noticed was the car about to run out of gas! Oh well, being used to full gas tanks when renting cars may be asking for too much. Fortunately, I located a gas station that was open. This visit drained me for 1500 local pesos, I immediately realized that I would need to find an ATM along the way. No more incidents except for a couple of really bad potholes until arriving in the outskirts of Santiago. The first thing I saw was a bank with an ATM and an armed guard outside, it was still very early, but daylight had arrived. One problem less to worry about, with a new supply of pesos I tried to guess how Hwy. 1 crossed through the city of Santiago. No easy task, I eventually accepted defeat and asked directions (to Santo Domingo) at a local gas station. Not surprisingly, I had to backtrack quite some ways, then drive towards the airport. Finally, back on Hwy. 1, I had lost about 30 minutes in Santiago. The drive now proceeded without any trouble to the town of Jarabacoa where I stocked up with one cola light and one package of sliced bread. Unfortunately, I continued straight instead of making a left turn and soon found myself driving along a dirt road. I was not worried about this as I had read that the road from Jarabacoa to Ciénaga was pretty bad. After a pretty long drive I came to a road fork. Since I had written down the coordinates for Manabao, now was the time to enter them into my GPS. OK, the GPS told me to take the left branch and continue about 12 kilometer. I continued driving, but the road got gradually worse, more narrow and more 4WD. The GPS was positive, telling me that less than 5 kilometer remained when the road virtually ended in an extreme uphill blocked by a parked truck. Obviously, a rather steep hillside separated me from the village of Manabao. A few locals (owner of the truck) showed up and quickly told me (in Spanish) that I would have to go back to Jarabacoa if I wanted to drive to Manabao. Bad news indeed, at least one full hour wasted, I started to worry about being able to complete my project within the planned timeframe. A good map had indeed been helpful, I had looked around for one back in Puerto Plata, but with no luck. With no further complications I drove back to Jarabacoa, then the correct way (largely paved!) to Manabao and onwards on good dirt to Ciénaga. At 1115 I was parked right next to the National Park Office. Not a sign of life to be seen anywhere. I walked around the building, then started walking back towards the tiny village in order to find somebody. It is required (helping the local economy) to have a guide on this trek, thus I could not just set off however tempting that would have been. 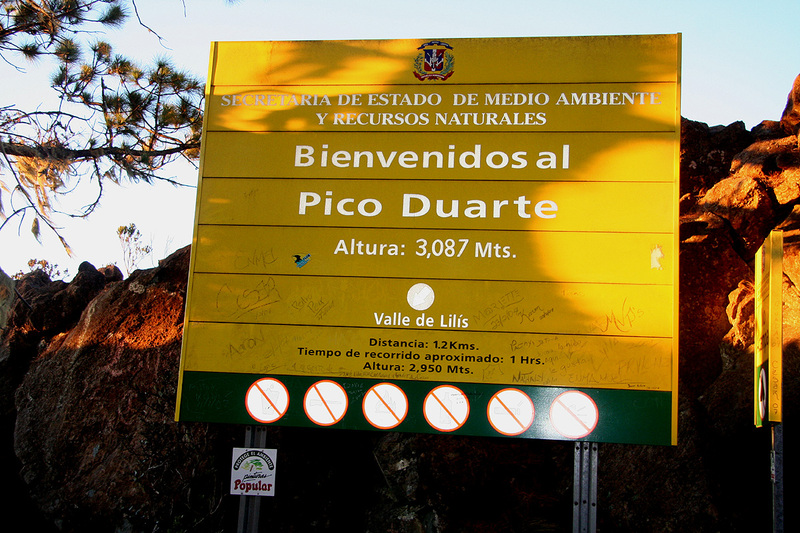 I met a local man in his sixties and explained to him that I wanted to hike to Pico Duarte. He suggested "mañana", but I made him understand that this was out of the question. Walking back to the top of the small local hill, he yelled in Spanish so everybody below should hear, and within 5 minutes a young boy appeared. His name was Tonis and he could act as a guide. The next question was about mules, the normal practice is to take mules along to carry gear and people. I said "no mules", I would carry all my gear in my own backpack. Tonis suggested that he could be ready to leave within 10 minutes if we could agree on a compensation for him in the amount of 4000 pesos. I found this quite agreeable and Tonis ran home to collect his normal equipment. We started out at 1150, Tonis with a small back, I with a somewhat bigger pack, still containing what I would say was a bare minimum. A jacket, my headlamp, my camera, my loaf of bread and two liter of water. Some chocolate, my bivy-bag, but no sleeping bag. No need to worry about a slow guide. Tonis was 24 years old and set a very good pace. 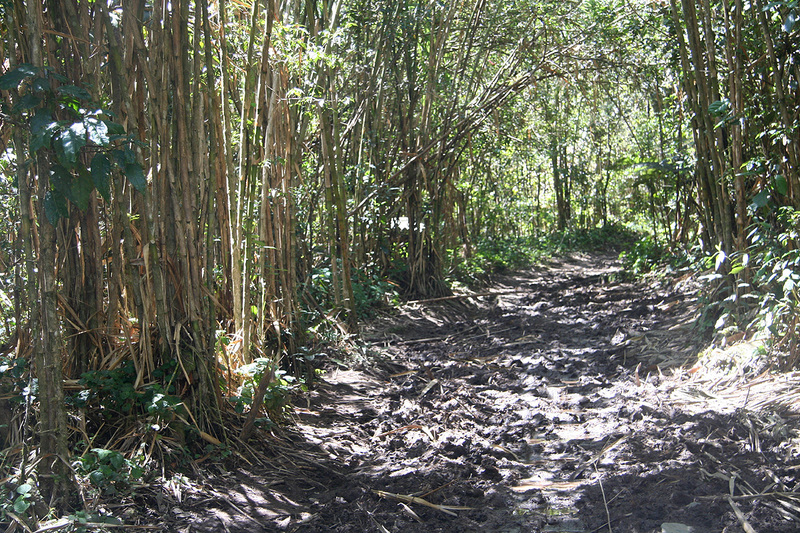 The trail was just bottomless mud, so he stayed along the edge dodging trees and bamboos while sometimes jumping across to the opposite side. I got quite busy just keeping up with him, obviously it was useful to see exactly where he stepped in order to avoid sinking into your knees in the mud. The fact that this trail sees heavy traffic by mules certainly contributes to the pretty poor condition. We passed Los Tablones after only 45 minutes, then the uphill started. 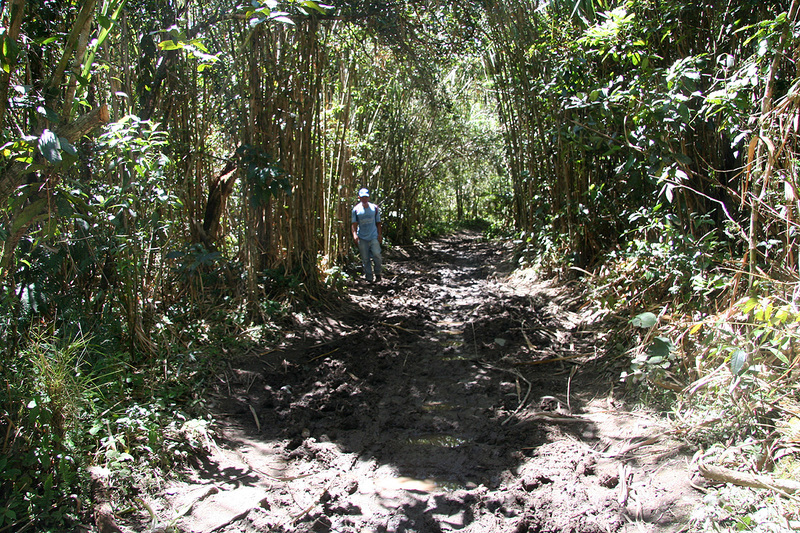 Still muddy, sometimes the trail resembled a deep trench as it climbed the ridge. I knew that the pace was too high and gradually slipped behind. Tonis waited politely in the shade at various points as we climbed steadily higher. Eventually, I picked up a better pace again having recovered from the brutal start, and we crossed the highest point on the main ridge about 4:15 after leaving the trailhead. For the first time, I could now see Pico Duarte. The bad news was a seemingly very deep valley that separated me from the peak. We rested and continued the walk at a somewhat more leisurely pace descending into the valley, while traversing quite a bit, thus avoiding the deeper part. Along this stretch we also overtook another party with mules, it turned out they had started out already at 0900 in the morning. Arriving at the hut called Comparticion around 1730, 5.5 hours of hiking in hot sunshine, quite a brutal return to serious hiking, I was quite exhausted and happy to rest. The other party arrived within half an hour, quite a contrast to my own somewhat primitive "mini-expedition". This was a lady from Florida that also spent considerable time in Punta Cana. She had gotten the son of her husband's work colleague, a young man in his mid-twenties to come along with her. The previous day (Sunday) they had driven across from Punta Cana to Jarabacoa, then three days for the climb plus a fifth day for the return journey. They needed a mule each to ride on as they were not into much hiking, then THREE more mules to carry her gear! Obviously, two guides were also needed to control the 5 pack animals. This "maxi-expedition" had taken 9 hours to get from the trailhead to Comparticion. I observed regular airline suitcases coming off the mules, quite amazing. We had an entertaining evening, the first English speaking people I had met since leaving my hotel. 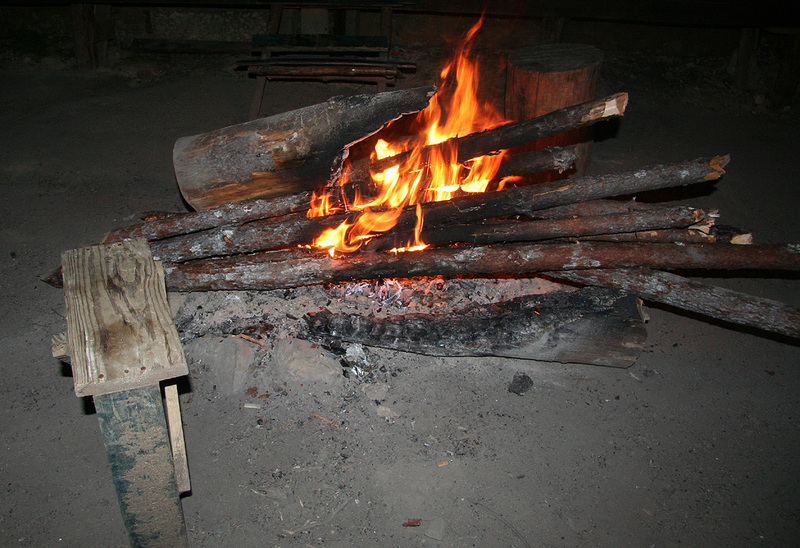 The guides made a big outdoor fire as well as elaborate preparations for cooking in the indoor "kitchen hut". They had enough food to feed a medium sized army, so I got some rice and chicken that was totally unplanned, but still nicer than my dry loaf of bread. My guide Tonis suggested that we start at 0400 the next morning. When asked, he admitted that we should easily make the summit in 2 hours. Since I wanted to be there in daylight, I suggested a start at 0500, this was instantly agreed. I went to bed around 2130, sleeping in my wool underwear plus the bivy-bag was indeed a new experiment. I slept well until 2300, when I woke up shivering. I pulled on my goretex pants as well as a fleece jacket. 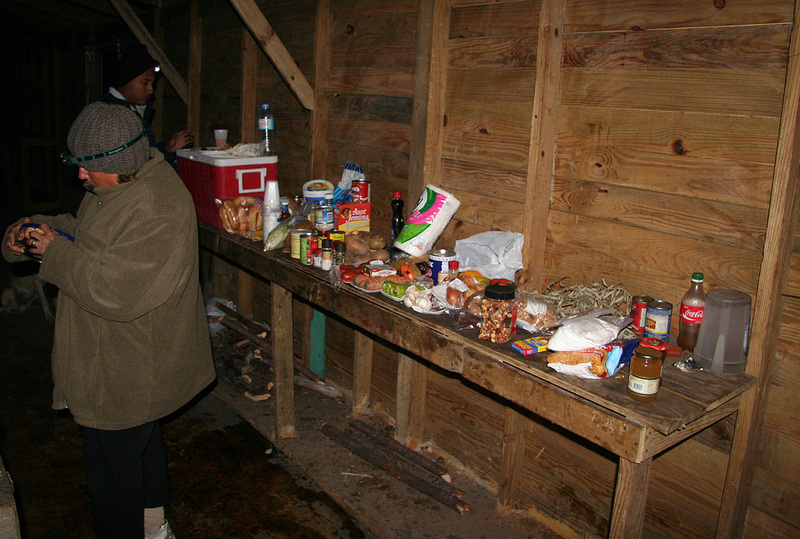 The temperature went down to about zero Celcius (32 Fahrenheit) and it was a bit cold to sleep without a sleeping bag or at least a blanket. Thus, I slept off and on with a bit of shivering, not a good scheme for a multi-day trip, but quite acceptable for a single night. I woke up around 0445, ate a few slices of my (dry) bread, then prepared for departure. 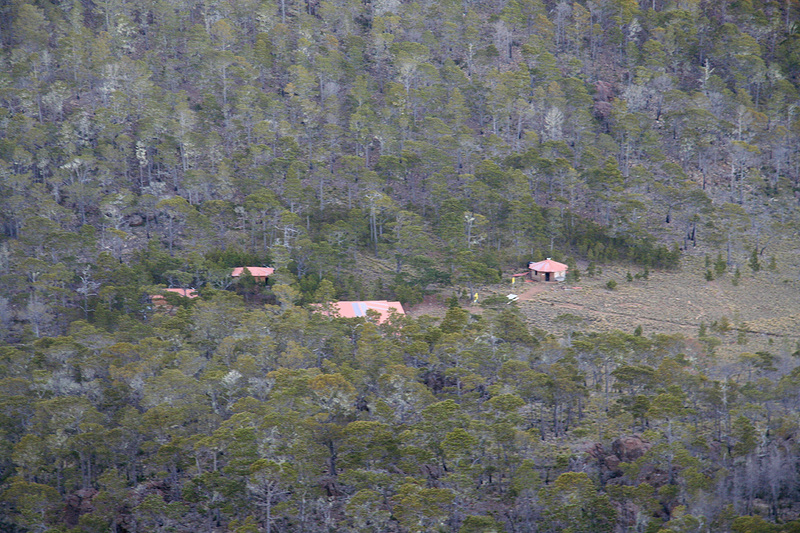 We left the hut at 0510 and had a rather easy hike to the summit, reaching it in 1.5 hours at 0640. It was still pretty dark, but the horizon was colored red by the sunrise effects. The sun came around 0655 and we enjoyed the fairly rapid change from night to day. 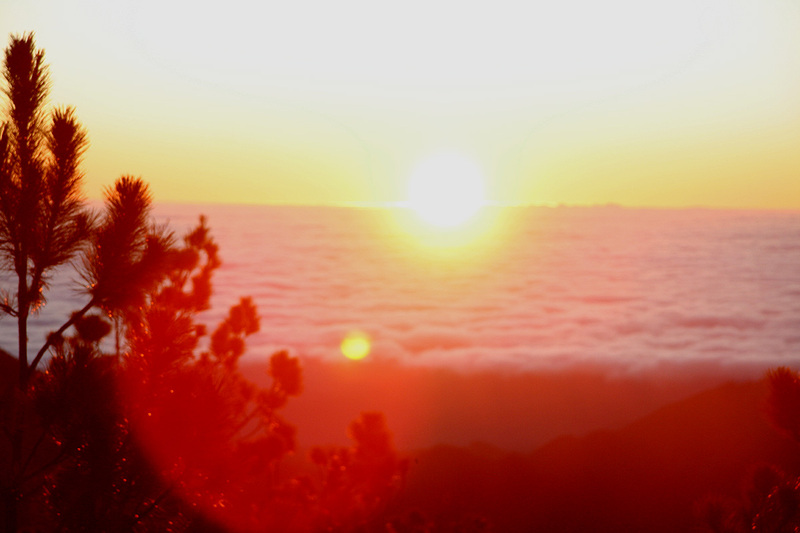 The land was covered by a layer of clouds with only a few hills and tops visible above. We spent about 30 minutes on the summit, before descendig back down to Valle de Lillis and then back to our base at Comparticion, the return hike took only 55 minutes. The other party was somewhat impressed that we had already completed what was their assignment for the day, the time being just a few minutes past 0800. Packing up the few pieces of gear, we started our return hike to the trailhead by 0830. I had feared the initial uphill, however, it was a smaller effort than anticipated. I made several stops for photography on my way back, welcome breaks to the somewhat never-ending downhill hike once we had crossed the main divide. The mud had not changed much since yesterday and the pace was about as high, thus I was again pretty happy (and tired) when arriving back at my car by 1340, a 5:10 return hike from Comparticion. Tonis got a warm thank you and his well deserved "quatro mille pesos". I changed back into driving clothes and hit the road, this time without any navigational errors. The traffic is pretty hectic around the city of Santiago, but I had no significant trouble in moving north in a safe and orderly manner. Parking outside Casa Colonial around 1730, the trip was successfully concluded. A nice bath, then a good dinner with Heidi a bit later, seemed well deserved. 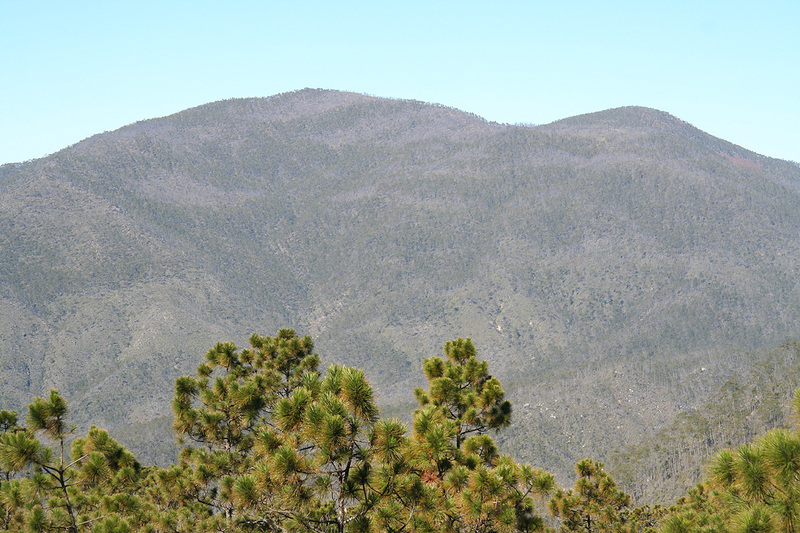 Pico Duarte (left) and Pelona (right), as seen on the approach hike. Tonis along the muddy trail. leading to Comparticion. 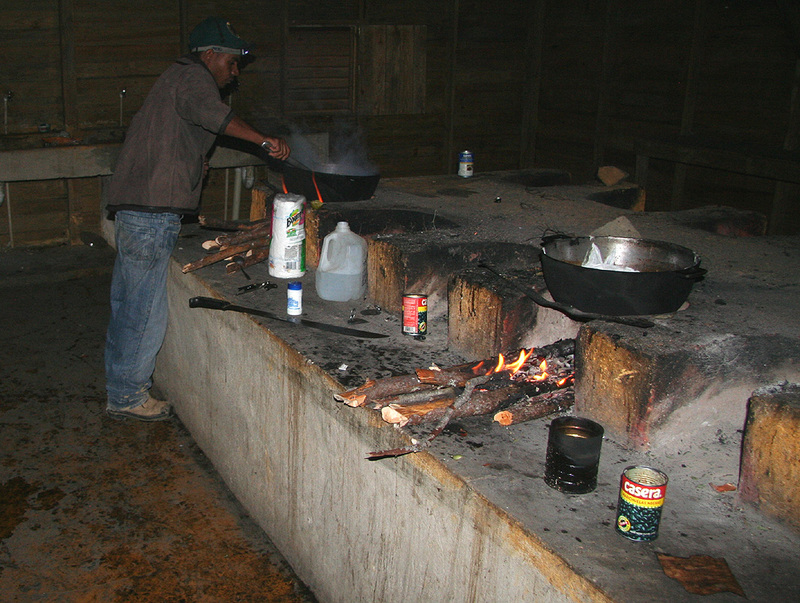 Dinner being served, at Comparticion. 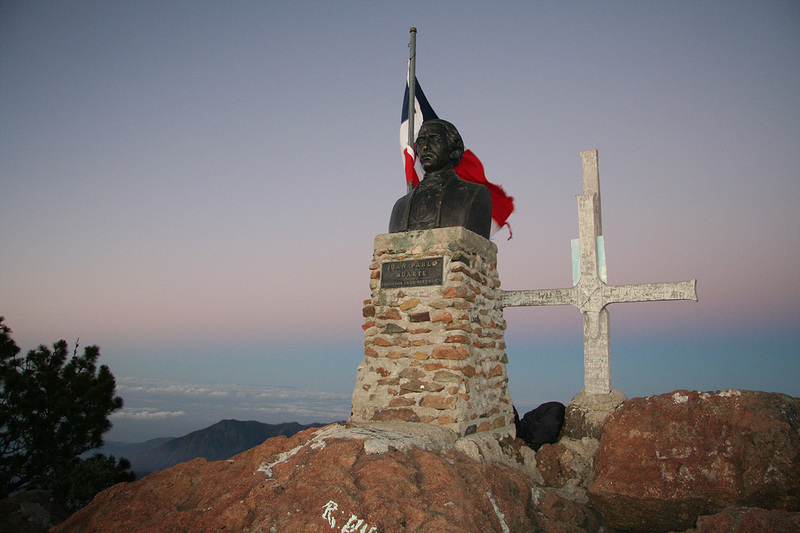 The summit of Pico Duarte, at sunrise. The hill across the valley. The trail crosses on the right side. 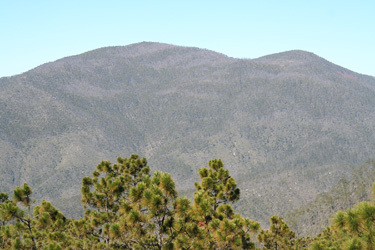 Summit view, from west to north. Pelona to the north. Summit view, east, the land is covered by clouds. Summit view, east, continued from the previous. Summit view, south-east, continued from the previous. 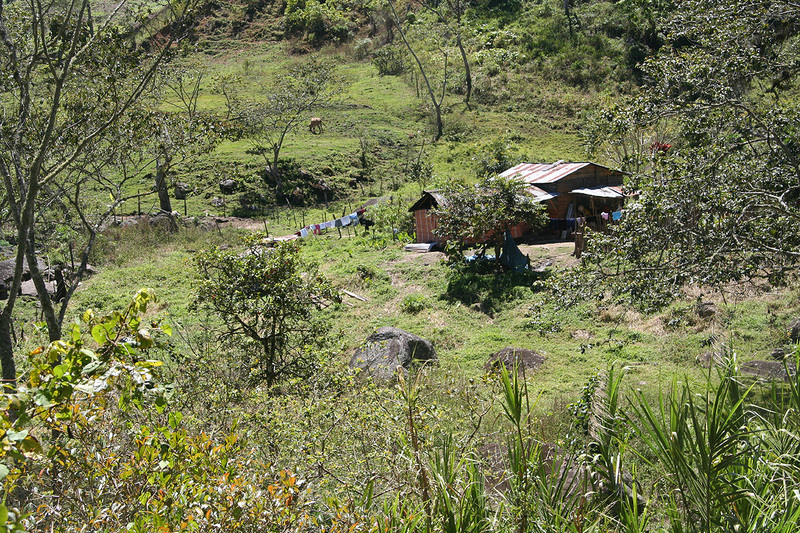 Huts, in the saddle between Duarte and Pelona.